We are happy to announce three day programme from 6th March to 8th March for the celebration of women's struggles and women’s movement in the country. We are proud of our strong base of the movement. However, we are yet to achieve our goal of women’s emancipation from patriarchal, economic, social and political oppressions. Therefore, the struggle continues. This exhibition will show women's achievements as well as the struggles that are still continuing. This will be shown through exhibition of publications, photos, videos and other forms of documentation. Women from different districts will participate in this Exhibition. The 100 years QUILT will be exhibited in the exhibition Hall. Women from different districts and from different organizations are invited to join in this event of Women in Black to celebrate as well as to raise our demands to achieve women's rights. Woman in Black is an international event organized since 1991. Speaking through silence and stillness, the Women in Black Movement against War and Violence, a worldwide movement for peace, has been brought to various countries of Asia such as India, Nepal Philippines and Bangladesh. Narigrantha Prabartana has been organizing Women in Black on different occasions since 2003. 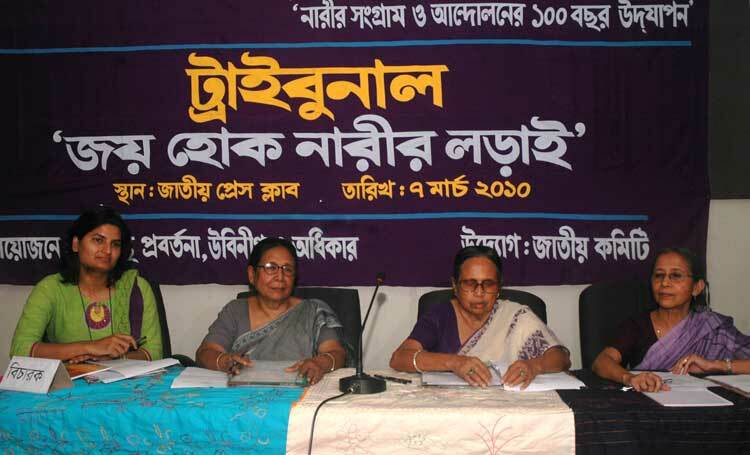 The Themes that have been discussed since January 2010 in the preparatory meetings will be presented and discussed to have a common Declaration of Women for 100 years and to be submitted to the Prime Minister, Government of Bangladesh on 8th March, 2010 and to relevant UN bodies. Designated speakers and open discussions will help develop the Declaration of Women for 100 years. The Tribunal will be held with testimonies of women's struggles and to raise their issues that are still affecting their lives. The testimonies of the struggles for the tribunal are diverse, from urban to rural such as farmers, midwives, workers, middle class working women, etc. A group of Women juries will be there to give statement after listening to the testimonies. YOUR PRESENCE IN THESE EVENTS WILL INSPIRE US. Farida Akhter, Convener , National Committee.